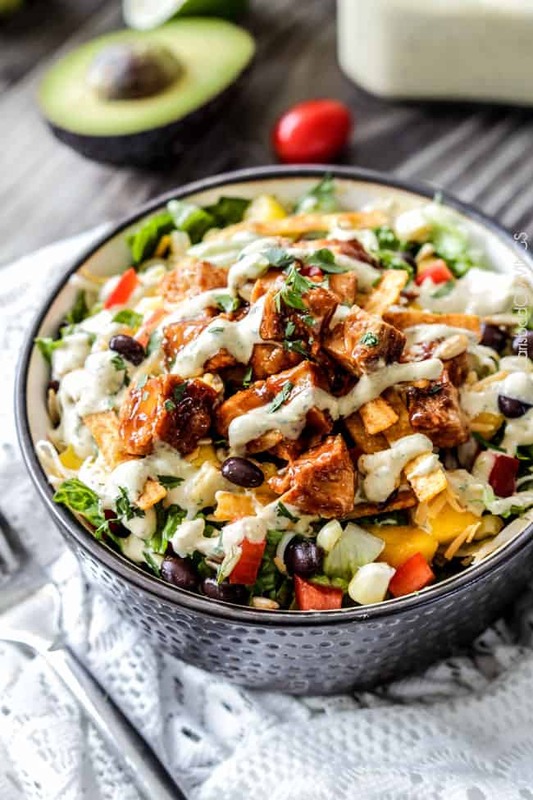 Chipotle BBQ Chicken Salad with Tomatillo Avocado Ranch is WAY better than your favorite restaurant salad at a fraction of the cost tossed with tender chipotle barbecue chicken and the most intoxicating dressing EVER! This BBQ Chicken Salad is is Ah-mazing! I was going for a CPK Copycat but I think your taste buds will agree this salad is even better! BBQ Chicken Salads have to be one of the most popular restaurant salads. For good reason. 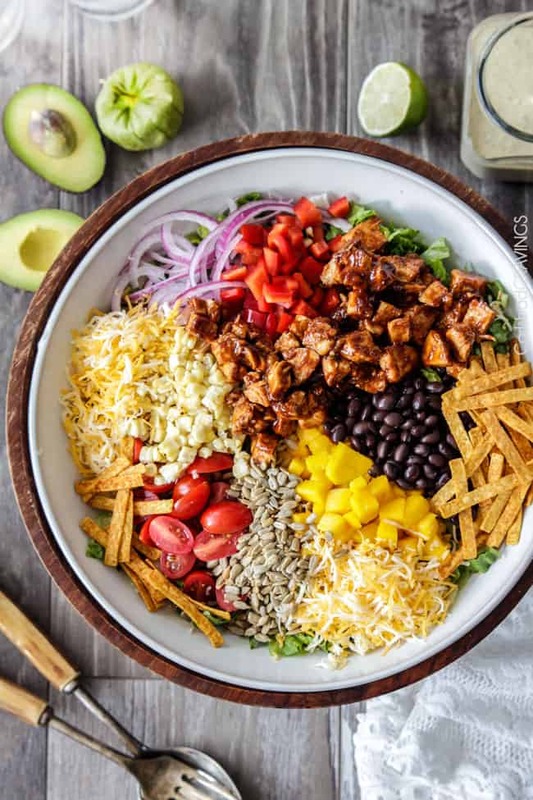 Even myself, who is not a huge salad girl, starts drooling over the loaded salad with juicy barbecue chicken, fresh vegetables and crunchy tortilla chips. Each bite is a flavor texture bomb and each explosion is epic. But…that flavor usually comes with an expensive $$ – until now! You can make your favorite BBQ Chicken Salad at a fraction of the price to feed your entire family! You can load on your favorite ingredients, skip the ones you don’t like or create a salad bar so everyone can create their own version of their favorite BBQ Chicken Salad. To me, a salad is only as good as the dressing and the protein. And this Chipotle BBQ Chicken Salad, is drizzled – or drowned – in one of my all time favorite dressings (we’ll get to the protein a second). 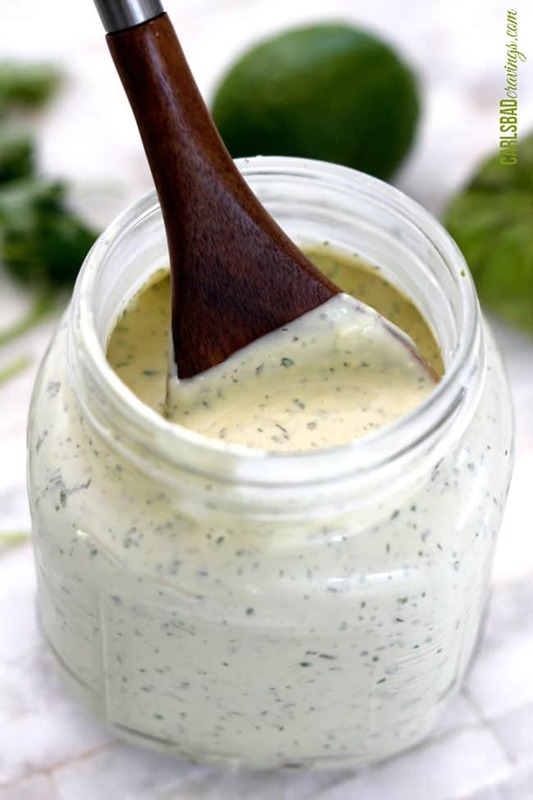 The obsessive worthy 5 Minute Blender Tomatillo Avocado Ranch Dressing is creamy, velvety ranch with a Mexican fiesta flair added by the avocado, tomatillo, jalapeno, garlic, cilantro, lime and smoked paprika. Layers of herbs, layers of spice, layers of luscious goodness that I just can’t seem to get enough of. And all you do is add all the ingredients to your blender and in less than 5 minutes you have created this heavenly dressing. I would say that this Chipotle BBQ Chicken Salad with Tomatillo Avocado Dressing is almost just an excuse to consume the Tomatillo Avocado Ranch by the lettuce-fuls if it wasn’t for the Chipotle BBQ Chicken because this chicken is drool worthy delicious. The chicken begins with my Easy All Purpose Chipotle Chicken Recipe which receives rave reviews and can be a meal all on its own with its easy, flavorful Mexican rub of chipotle chili powder, chili powder, cumin, smoked paprika, garlic and onion powder BUT this chicken gets even better after cooking/grilling with a BBQ bath transforming Chipotle Chicken into tender, juicy, Chipotle BBQ Chicken! 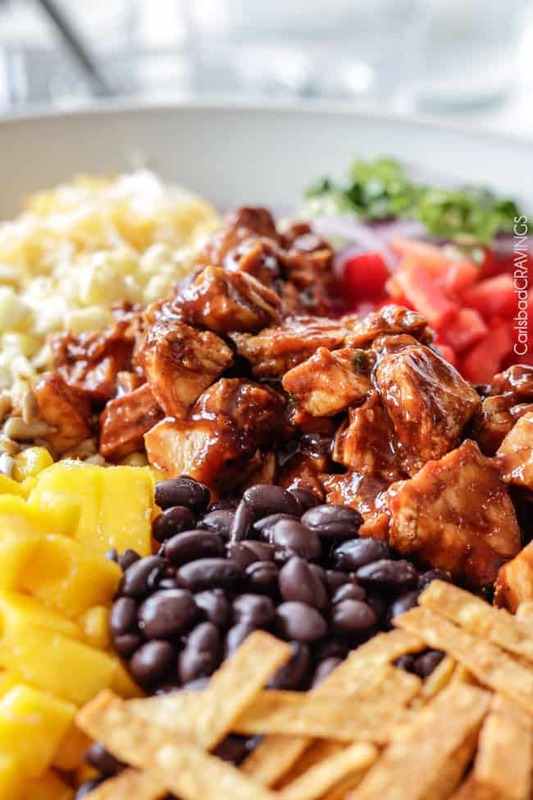 The dressing and chicken are supported by an encore cast of crunchy red peppers, jicama, fresh corn, black beans, tomatoes, sunflower seeds, Mexican cheese and my personal favorite, sweet mangos. I love sweet mangoes and spicy chipotle together! (Exhibit A, Exhibit B, Exhibit C)). And if you are intimidated by cutting mangos – do’t be, just check out my How to Cut A Mango Post that teaches everything you could ever want to know about mangos! Feel free to also add avocado which is missing in the picture but absolutely heavenly. The salad recipe ingredient list is simply a guideline – use as as much or as little – or omit completely – whatever salad ingredients your stomach desires. 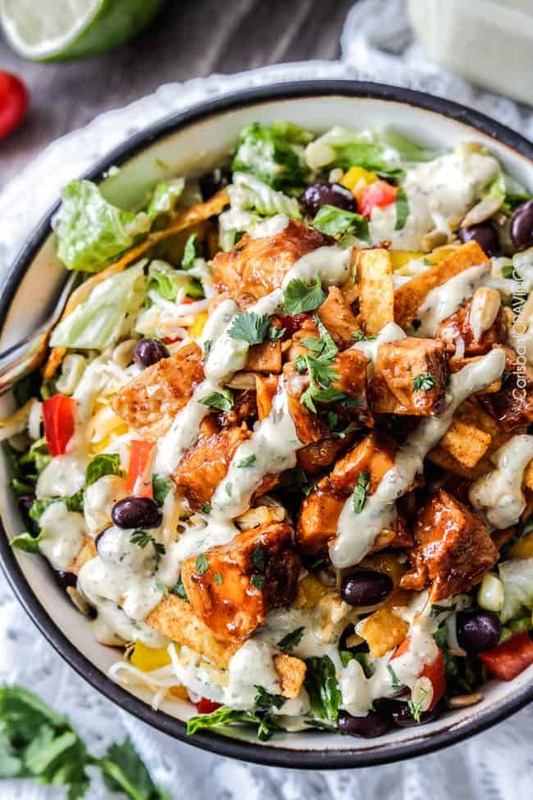 Top your Chipotle BBQ Chicken Salad recipe with crispy tortilla strips and you have just made one of the best salads in the world. The world I tell you! 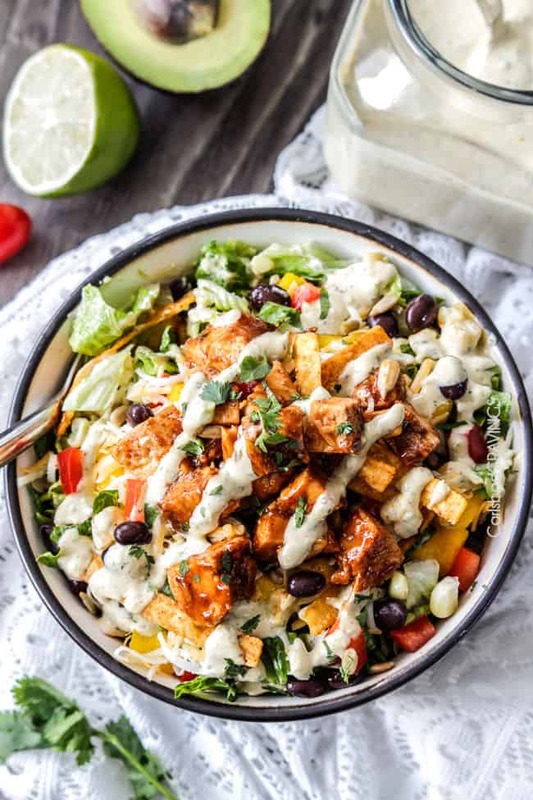 Chipotle BBQ Chicken Salad with Tomatillo Avocado Ranch is WAY better than your favorite restaurant salad at a fraction of the cost tossed with tender chipotle barbecue chicken and the most intoxicating dressing EVER! This BBQ Chicken Salad is is Ah-mazing! I was going for a CPK Copycat but I think your taste buds will agree this salad is even better! Prepare 5 Minute Blender Tomatillo Ranch according to directions. Best chilled before serving. Prepare Chipotle Chicken according to directions. 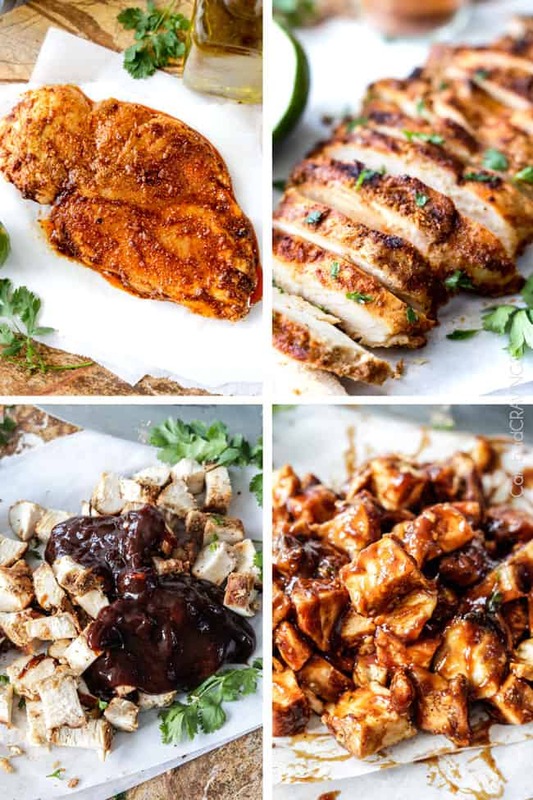 Chop cooked chicken into bite size pieces and toss with 1/4 cup barbecue sauce or enough to generously coat. To assemble, add the Salad Ingredients, chicken, cheese and sunflower seeds to a large bowl and toss to combine. 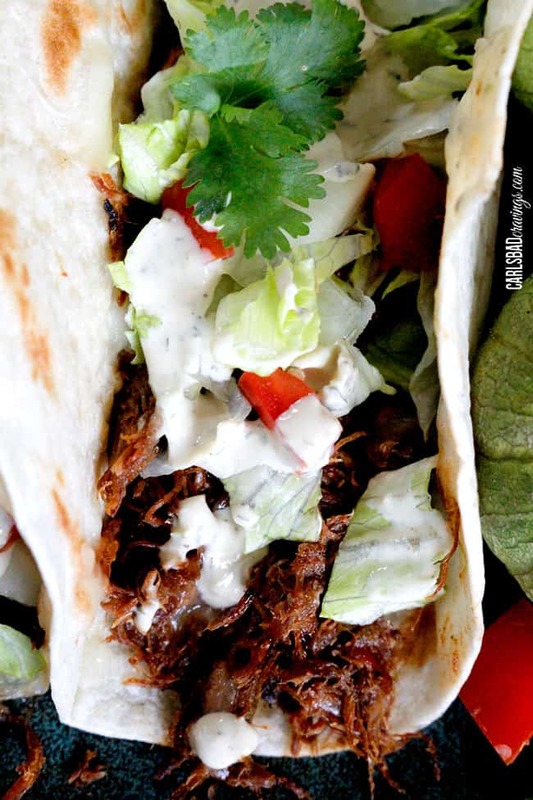 Garnish individual servings with tortilla strips and drizzle with dressing. This salad is delicious! The chicken is so flavorful, and I love the dressing! This is a keeper. Thanks so much for sharing your recipe! You are so welcome Kristin, thanks for trying my recipes and for your nice comment! 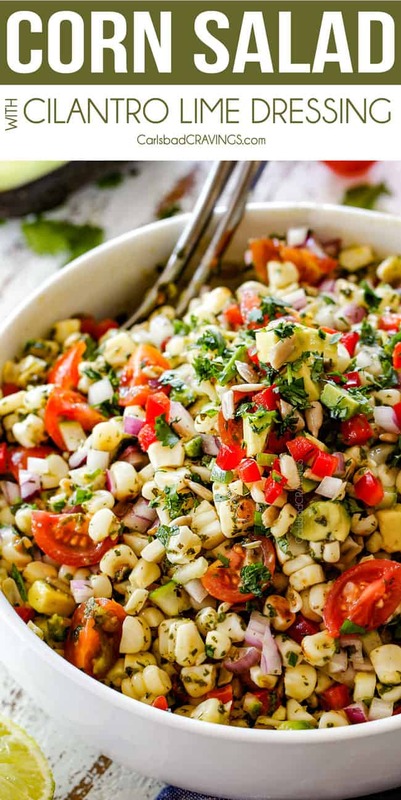 I love that you love this salad because it is one of my favs! While eating this Jesse turned and said, “I’m so glad you cook well.” To which I responded, “I just follow Jen’s directions!” Fantastic. The end. I LOVE this salad! I made it exactly as written (including the chicken, dressing, and recommended garnish). It is sooo good! I made lots so I had leftovers. I’ve been eating it almost every day for lunch this past week and I still love it! I will probably make another batch again soon. Thanks so much! Could I sub olive oil for the canola oil? Yes, that would be just fine! Enjoy! best comment. Thanks Esther! One of my absolute favorites too! This salad was yummy! I loved all the flavors! I used a cilantro cotija dressing and no bbq sauce. I loved the flavor of the chipotle chicken too much to cover it with sauce. Perfect marinade! The jicama at heb was nearly $5 so I didn’t use it, but I do love the crunch it adds to salads. I added avocado and used green onion instead of red. Can’t wait to make this again, great recipe! Hi Crissy, sorry for the delay as I am way behind after recovering from pneumonia, but I so appreciate your comment! I’m thrilled you loved this salad so much and even loved the chicken too much to cover it with dressing 🙂 Your addition of avocado sounds delicoius! This was seriously delicious!! The dressing was one of the best home made ones I have ever made. 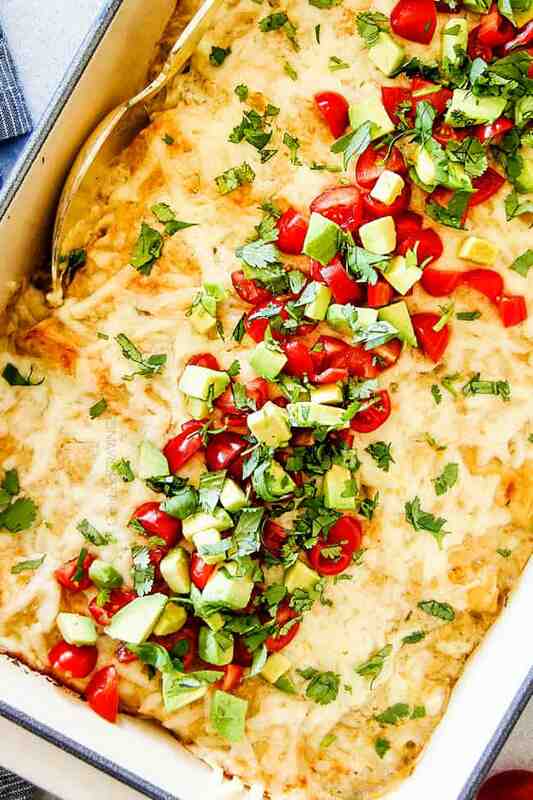 I served this to guests and it was a big hit. Thanks for sharing! You are so welcome Janet! I am thrilled you loved this salad as it is still one of my favorites! I’m so happy it was such a hit! I made this for my family tonight and they just loved it! Good job! YAY! I’m so happy it was a hit with the family! Its always nice to find recipe everyone loves. Thanks so much Lecia!